A simple interactive test for 8 grade Information technology subject evaluation. Computer science test. Computers, main peripheral devices and overall computer usage. A small 18 question interactive test for desktop computers, laptops and tablets, which may be solved online in the web browser. The IT Knowledge Board include 18 fun questions with integrated evaluation system. 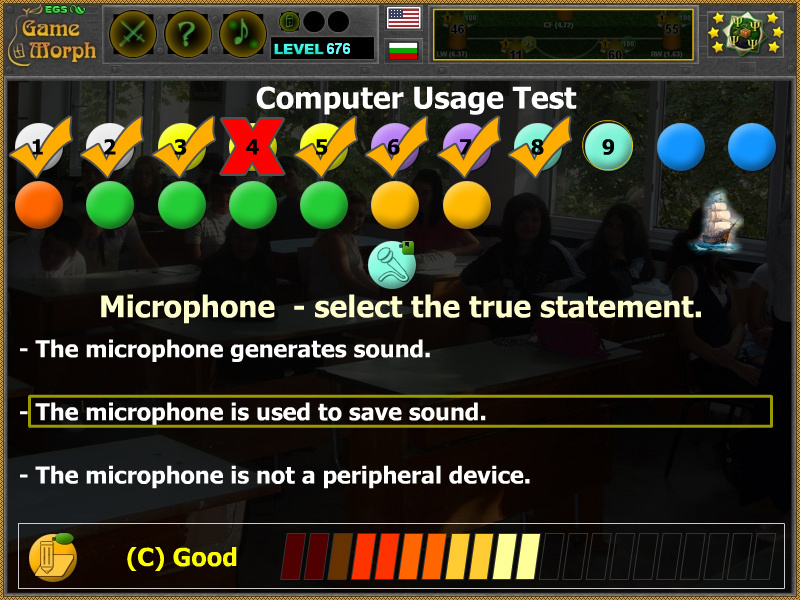 The test is part of the Interactive Computer Tools educational games. It is cumulative with the Computer Tree game. 7 grade classes for evaluation or theoretical lessons. 8 grade classes for evaluation or theoretical lessons. 9 grade classes for evaluation or theoretical lessons. 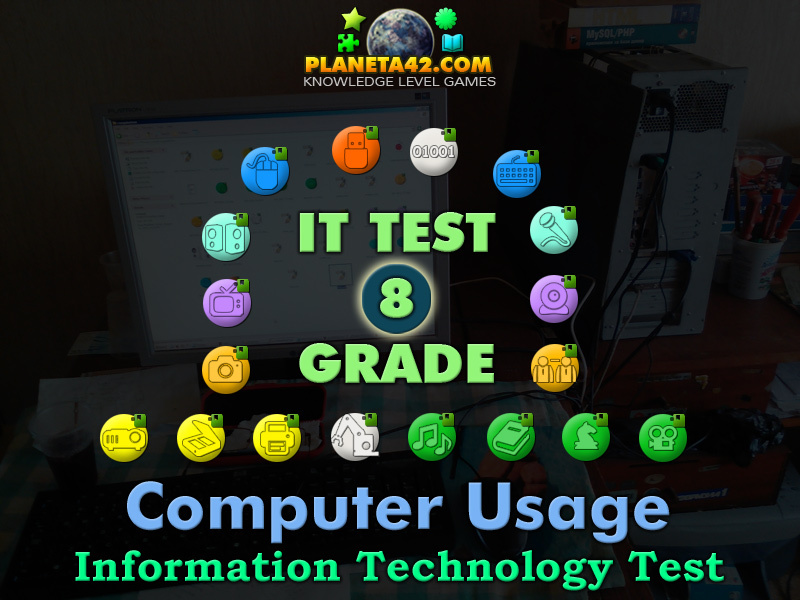 How to play Computer Usage Test. Read carefully the question and select one of three answers. Every question has only one correct answer. Finishing 8 grade in Information Technology subject with a good mark. Here is a gameplay movie how P42 tests works on YouTube. - Computers only understand sound. - Computers understand binary data. - Computers understand human speech. - Computers are controlled by man. - Computers are self controlled. - Computers can not be controlled. - The printer is an input device. - The printer is not a peripheral device. - The printer is an output device. - The scanner is an input device. - The scanner is an output device. - The scanner is not a peripheral device. - The projector is not a peripheral device. - The projector is an input device. - The projector is an output device. - Every computer has a camera. - Computers can not have camera. - Cameras allow real time visual chat and stream. - Modern TV’s can not be used as monitors. - The TV can be input and output device. - The TV is software. - PC Speakers are not a peripheral device. - PC Speakers can show pictures. - PC Speakers generates sound. - The microphone generates sound. - The microphone is used to save sound. - The microphone is not a peripheral device. - The keyboard is not a peripheral device. - The keyboard is an input device. - The keyboard is an output device. - The mouse is an input device. - The mouse is not a peripheral device. - The mouse is an output device. - Flash drives are software. - Flash drives are used to store information. - Computers can write books. - The computer is a book. - Computers may be used to read or listen to books. - The computers can not play music. - The computers may be used to listen to music. - The computer is a song. - The computers are used only for work. - Computers can cheat in games. - Computers may be used to play games with friends. - The computer is a Movie. - All movies are free. - Computers may be used to watch movies. - Photos are saved as text files. - Photos can be stored on the computer. - Computers can not be used to see photos. - Computers can be used to chat with friends. - Only government can communicate with computers. - To communicate trough computer a satellite is needed. Labels: IT Tests , Test Games , Flash Games , Computer Tests , Education Games , Free Online Tests.